I've been away for a week and the weather has been damp. This has brought forth a respectable crop of mushrooms in the grass of the orchard. 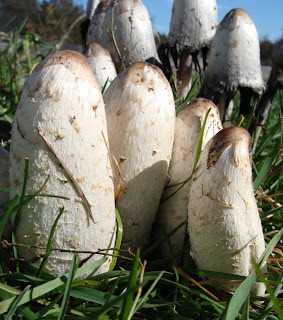 These are shaggy ink caps - also known as shaggy manes or lawyers' wigs (Coprinus comatus) - which gradually dissolve into a black ink as they mature in a process known as deliquescence. The ones in the foreground are young specimens, while those behind them are beginning to deteriorate at their bottom edges. 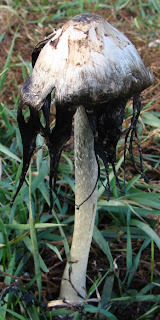 In this photograph, the inky cap is well on its way to disintegration. *I think this qualifies as my favourite new word of the week. Snap ... I just took some photos of ink caps today too. Thanks for the added info. Hope you have a tasty meal. I love the name 'lawyer's wigs' - hope they were delicious! Neat! I hope your supper was yummy. We picked some of these this last summer. You picked a good one to start with: easy to i.d., and very tasty. I only found two this year and I envy your harvest.